Communicators often confide in me that they don’t really like using Facebook (and other social media) for their organisations because people will probably post snarky things in the comments section of each post. Especially if they’re communicating potentially controversial work. So what they do is whisper what they’re doing. They say the bare minimum, and avoid talking about the great stuff for fear of setting off a debate on the less popular. Lots of my work in the last few years has been about encouraging organisations to own what they’re doing. To be bold, to believe in it, and take criticism on the chin. To not deny your organisation the community support and awareness it desires, for the sake of avoiding those who won’t like it. So if you’re waiting to promote an entirely positive project, you’ll be waiting a long time. I’ve been working with an organisation in Wales that raises awareness about autism, and I think how they are handling comments is brilliant. They’ve launched a scheme that allows people with autism to help communities be more aware of autism and the difficulties individuals face. Shops, banks, hairdressers, cinemas are given tips on how to interact with people who have autism, and people with autism can wear a wristband, show an app, or carry a card to indicate they’re autistic – if they want to. A survey showed 11% of adults and 13% of parents and carers said they would not use the band. Totally valid and I think I’d feel the same if in similar circumstances. Everyone’s experience is different. But it’s only meant to help those who want to take part, and the team know not everyone will feel it’s for them. So why be shy? Of course some people will not like the idea at all. But the team have done their research and their intentions are great – promoting understanding and acceptance and reducing the stigma that many individuals with autism and their parents and carers experience. And they’re willing to learn and adapt. Their video explaining it has been widely shared and viewed on Facebook. Here are some examples of the great conversations they’re having – confidently explaining what they’re doing, and totally respectful and understanding of those who are not keen on the idea at all. All the while, they are raising awareness, which is the objective. We’re often we are told by our employers that we should be telling the good stories of the organisation. We should be promoting services, and getting good coverage. But communicators are more than just in-house reporters. We listen, we inform or/and shape decision-making, we are community managers, and we take the rough with the smooth. People who don’t agree with you about what you’re saying can still be productive and civil if you can show that you’re working for the same outcome. Leave a comment on this blog post if you like, I won’t mind if you disagree. Really great post Helen, communicators or potential communicators are often held back by fear of criticism, it’s great to see this good, solid advice and encouragement. 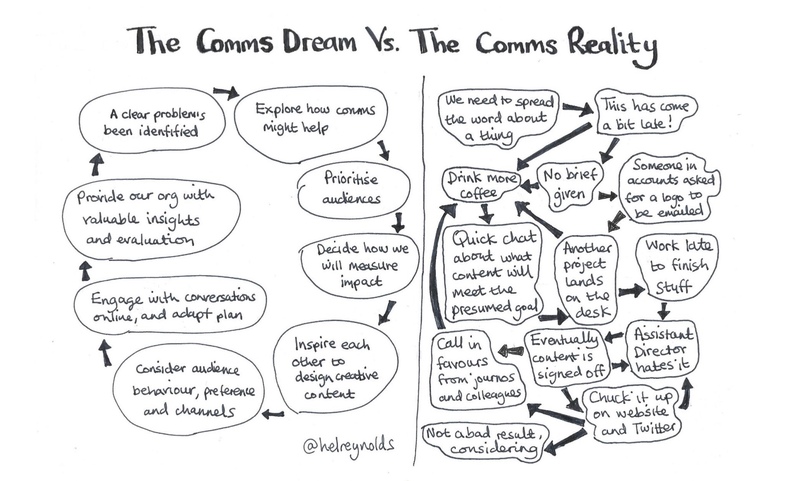 Next The comms manifesto – will you sign up?